Making a marble bathroom is always more appreciated for the new processing technologies that give sinuous and captivating shapes of stone. 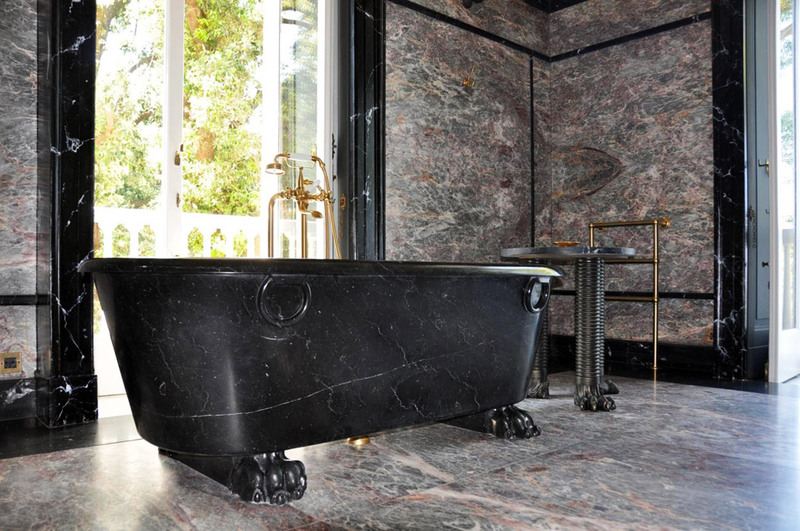 A marble bathroom, which is white or dark, is an investment that lasts over time. A marble bathroom undoubtedly represents a touch of exclusivity and value that no other material can offer. Marble is an extremely versatile element: it is perfect for realizing the whole bathroom. Furthermore, you can also combine it with other materials and colours, to make the environment even more precious and refined: just combine brass and black marble for a sink in order to achieve an effect without comparison. Marble bathroom is often dictated by a minimalist choice. The combination of white marble and black marble offers a refined contrast for flooring which can be put in juxtaposition, for example, with the sink and the bathroom fixtures. Of course, white marble also guarantees the possibility of playing with colors and, above all, with shades. Pink inlays within a white marble bathroom with black marble bathroom fixtures. Likewise, a black marble bathroom with white bathroom fixtures can create contrast as well. The possibilities offered by the use of marble for the realization of a bathroom are really innumerable. To complete a marble bathroom you can use marble slabs as wall or floor coverings, to give the whole room great brightness, in addition to aesthetic quality. However, marble for the bathroom is also a perfect material for those who do not like minimalism but love design. Marble can in fact be adapted to the most creative forms, both for coverings and for bathroom fixtures. 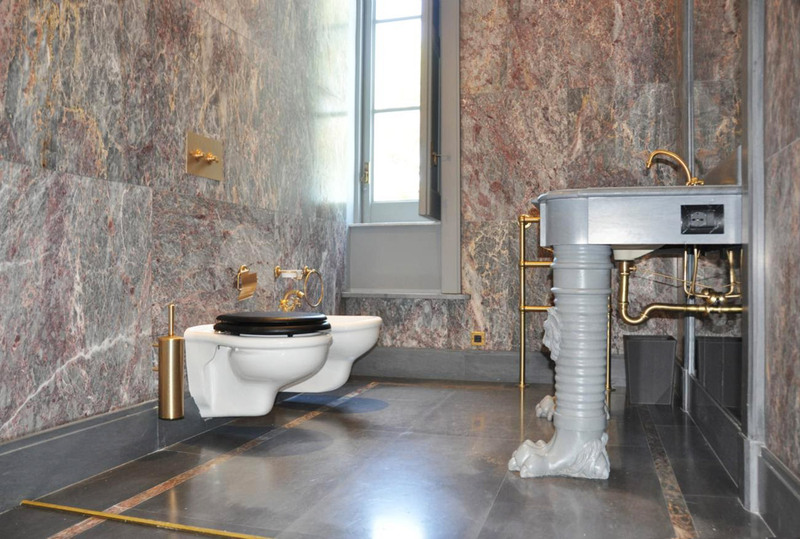 A marble bathroom can also be accompanied by other materials and colours. We mentioned brass, but also resin is a valid material since it goes well with the furnishings. Or even wood is perfect in order to create that particular combination between the eternal material (marble) and the more volatile one (wood). One does not necessarily have to think about single-color marble for the bathroom covering. You can also take advantage of the geometries and create original compositions. The other conceptual mistake that is often made is to think of a large marble bathroom, like in a movie. It is not exactly like that. Marble goes well also with small bathrooms. As a matter of fact, the brightness of the material can obviate the lack of space, creating airiness to the room regardless of the square meters available. Of course, if there is a lot of space you can even think of a marble bathtub, a sink made from a single piece of marble, and so forth. In conclusion, whether it is big or small, your marble bathroom will always have its undeniable spectacular effect. Leave your guests open-mouthed and enjoy your time in one of the most intimate areas of your home. D.E.SIGN S.r.l. | Luxury Bathroom Fittings in Lightweight Marble. P.I./C.F. 01268660451 | Registro Imprese of Massa Carrara | REA number 127201 | Soc. Cap.. 10000 € i.v.